NEW ORLEANS – With the 2018 NCAA Division II Cross Country Championships not until early December, the majority of NCAA DII programs around the country used this past weekend as one final tune-up to get ready for conference and regional championships that are right around the corner. That meant there was a lot of movement to be had in the latest edition of the Regional Rankings, released on Tuesday by the U.S. Track & Field and Cross Country Coaches Association (USTFCCCA). The Rock Pre-Nationals and the Western Washington Classic were the two races to watch this past weekend as they included a grand total of eight nationally-ranked men’s teams and 10 nationally-ranked women’s programs going head-to-head on the course. With the running of such high profile meets, one could expect great change to the Regional Rankings and that is exactly what happened as seven of the eight regions saw some kind of movement to its top-five teams on the men’s and women’s side. There were also new No. 1 teams crowned in the Atlantic for the men and in the East Region for the women. Just one region, the South Central, had no movement in either top-five rankings. There’s a new No. 1 for the men in the Atlantic Region as Shippensburg moved into the top spot for the first time since the preseason rankings. They were followed by No. 2 Charleston (W. Va.), No. 3 Edinboro, No. 4 Indiana (Pa.) and No. 5 Kutztown. Both Charleston and Indiana saw improvements as Charleston went up one and Indiana shot up four places. There wasn’t as much change to the women’s side of things although it too had a big improvement from one of its top-five programs. The top-two teams remained the same in No. 1 Edinboro and No. 2 Shippensburg. It is the seventh consecutive rankings the two teams have stayed in their current rank. Moving into the No. 3 spot was Lock Haven after a six-spot improvement from the previous rankings. It ties the best mark received in program history, a record set back during the 2011 season. No. 4 Kutztown and No. 5 Seton Hill each dropped one since last week to round out the top-five. The Pennsylvania State Athletic Conference (PSAC) Championships and the Mountain East Conference Championships are the championship meets to keep on eye on in the Atlantic. Both are set for November 3. There was slight movement for the men in the Central Region but the top spot remained with Augustana (S.D.) for the seventh-straight week. Dating back to last season, the Vikings have held the top spot for 11 consecutive rankings. No. 2 Sioux Falls and No. 3 Missouri Southern traded places from its previous ranks while No. 4 Minnesota State and No. 5 Fort Hays State remained in place to make up the rest of the top-five. The top of the women’s charts remained in tact as well but the top-five still saw movement. No. 1 U-Mary and No. 2 Augustana (S.D.) held in its spot at the top for the seventh-straight poll. No. 3 Oklahoma Baptist and No. 4 Southwest Baptist both improved one spot from its previous position while Pittsburg State rounded out the top-five. The Northern Sun Intercollegiate Conference (NSIC) and the Massachusetts Interscholastic Athletic Association (MIAA) are the meets coming up to keep track of in the Central. Both are on November 3. The No. 1 for the men might have stayed the same but a new top team was selected on the women’s side this week. Stonehill held in the No. 1 spot for the men while the rest of the top-five experienced quite the shake up. Southern Connecticut improved two spots to No. 2 while American International and Southern New Hampshire each experienced a one spot drop to No. 3 and 4, respectively. No. 5 Merrimack shot up three to move into the top-five for the first time this year. It ties a program high for the Warriors that was achieved during the 2013 and 2014 seasons. Roberts Wesleyan took over the No. 1 spot on the women’s side for the first time since 2014. They were followed by No. 2 Stonehill, No. 3 Merrimack, No. 4 Saint Anselm and No. 5 Southern New Hampshire. The biggest improvement of the group belonged to Saint Anselm who jumped into the top-five after being unranked the week before. It ties a program-high set back in 2013. There are three conference championships to keep an eye on for this region; the Central Atlantic Collegiate Conference (October 28), the East Coast Conference (November 3) and the Northeast-10 (November 4) Championships. The top of both the men’s and women’s rankings in the Midwest remained the same while the rest of the top-five teams experienced some kind of movement. Grand Valley State was once again the top program in the region on the men’s side, a spot they have held for seven weeks to open the year. The Lakers have been the No. 1 team in the Midwest for an absurd 66-straight rankings or every single week since official numbers started in 2010. Saginaw Valley State held at No. 2 while Cedarville shot up three to No. 3 which tied a program best for the Yellow Jackets. Malone stayed put in No. 4 while Walsh fell two to No. 5. There was even less movement on the women’s side of the charts as the top-three teams all remained in No. 1 Grand Valley State, No. 2 Walsh and No. 3 Hillsdale. It is the 22nd-straight week the Lakers have held the top spot in the region, a run that dates back to the Week Five Ranking of 2015. No. 4 Michigan Tech and No. 5 Saginaw Valley State each improved one spot from the previous ranking to close out the top-five. The three conference championships to follow in the Midwest are those of the Great Lakes Intercollegiate Athletic Conference (GLIAC), the Great Midwest Athletic Conference (G-MAC) and the Great Lakes Valley Conference (GLVC). All three will run on November 3. The top-five men’s teams in the south remained the same while the women’s side saw much more movement in this week’s rankings. For the men Lee (Tenn.) was still the top team in the region and was followed by No. 2 Alabama-Huntsville, No. 3 Embry-Riddle (Fla.), No. 4 Mississippi College and No. 5 Saint Leo. Lee has held No. 1 spot for all seven rankings released this season. While Lee (Tenn.) was also the No. 1 team on the women’s side for the seventh-consecutive week, the rest of the top-five got shifted around. Tampa moved up two spots to No. 2 while No. 3 Alabama-Huntsville and No. 4 Embry-Riddle (Fla.) each fell just one spot. No. 5 Florida Southern improved one to move back into the top-five. The two conference championships to keep an eye on in the South are those of the Gulf South and Sunshine Conference. Both championships are set for November 3. The South Central was the only region in this week’s rankings that saw no change to either its men’s or women’s top-five. The No. 1 spot for the men remained with Adams State who was then followed by No. 2 Colorado Mines, No. 3 Western State, No. 4 CSU-Pueblo and No. 5 Dallas Baptist. The top-four teams in the South Central have remained the same for seven consecutive rankings. Adams State also held the top spot for the women and were trailed by No. 2 Western State, No. 3 Colorado Mines, No. 4 UC-Colorado Springs and No. 5 Dallas Baptist. The top-three teams have stayed the same for seven-straight weeks. All eyes in the South Central will be on the Rocky Mountain Athletic Conference (RMAC), the Heartland Conference and the Lone Star Conference (LSC) Championships. All three meets are scheduled for November 3. The men of Queens (N.C.) remained in the top spot of the Southeast for the third-straight week. The Royals have been selected as the top team in the region for six of the seven rankings so far this season. No. 2 Mount Olive stayed pat in its previous rank as well while UNC Pembroke improved one to move into No. 3. The rest of the top-five belonged to No. 4 Augusta and No. 5 Anderson (S.C.). The women’s side did not experience a single change to its top-five. Queens (N.C.) held down the No. 1 spot for the seventh consecutive week while No. 2 Mount Olive, No. 3 Flagler, No. 4 Anderson (S.C.) and No. 5 North Georgia rounded out the top-five. The three conference championship meets to track will be those of the South Atlantic Conference, the Conference Carolinas, and the Peach Belt Conference. All three meets will take place on November 3. 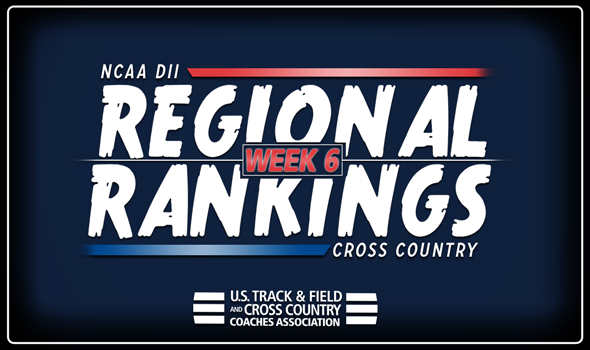 The West Region remained slightly more stable than others but it still saw a new program make its way into the top-five on the men’s side. No. 1 Chico State and No. 2 Simon Fraser kept its spot atop the charts for the third-straight week. While Simon Fraser took over the No. 2 spot in Week Four, Chico State has held at No. 1 all year. Alaska Anchorage shot up three to No. 3 to rejoin the top-five once again. No. 4 Cal Poly Pomona and No. 5 Western Washington made up the rest of the top-five. Chico State also remained in the No. 1 spot for the women while No. 2 Simon Fraser and No. 3 Alaska Anchorage traded spots from the previous ranking. No. 4 Azusa Pacific and No. 5 Seattle Pacific stayed in its spots to create the rest of the top-five. There are three main conference champions to follow in the West; the Pacific West Conference (November 2), the California Collegiate Athletic Association (November 3) and the Great Northwest Athletic Conference (November 3) Championships.